A giant gorilla is taken from its home in the jungle to be exhibited in California. 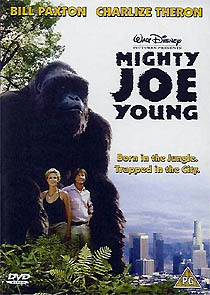 Reverting to it’s original title after its UK theatrical release as Mighty Joe, Ron Underwood’s dumbed-down remake boasts state of the art animatronic and CGI effects, an appealing performance by Charlize Theron, and validating cameo appearances by Ray Harryhausen and Terry Moore. The DVD presents the film in 1.85:1 ratio, enhanced for 16:9 TVs, with a strong, vibrant image, and wonderfully elaborate 5.1 sound. The US version has a trailer and worthless featurette, but isn’t 16:9 enhanced.